Leap and Splash, 2016, by Fumiyo Yoshikawa. Ink and watercolor on shikishi. © Fumiyo Yoshikawa. Fumiyo Yoshikawa was born and raised in Kyoto, where she studied Japanese art and history. 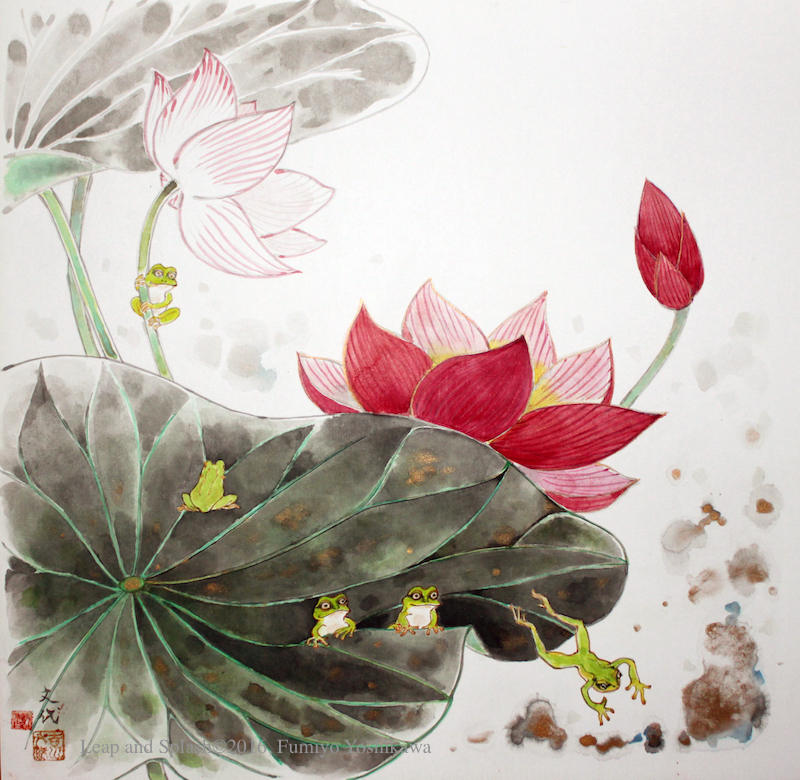 She specializes in Japanese brush painting methods, Sumi-e and Nihonga. This master artist will give a hands-on workshop on painting. She will demonstrate traditional Japanese techniques as well as incorporate kimono patterns into her presentation. This will tie in with the current special exhibition, Kimono Refashioned. One of Yoshikawa's goals is to introduce the aesthetics of Japanese culture to the study group participants. Don't miss this special opportunity to work with both an artist and a teacher. You will gain valuable insight from Yoshikawa's teachings. Lunch will be included as well as art supplies. You are welcome to bring your own paint brushes and paper. Fumiyo Yoshikawa lives in the East Bay, where she teaches classes as well as exhibits in galleries and shows. Her studio is in San Pablo. Note: We are not accepting drop ins for this study group, because we are providing lunch to participants. In addition, the study group starts at 9:30 a.m. before the museum opens to the public. Only registered attendees will be allowed into the museum. Thank you for your cooperation and understanding.